By hook or by crook, I am going to get that 3-5-2 midfield sort up tomorrow. But first, I have to say I'm really enjoying the new MLS season thus far (and not just because so many of my team and player projections are coming true). And as much as the play on the field has improved again, it's much more than that. Shrewd transfers, engaging new personalities and early intrigue have all played a part. Naturally, the most nuclear-powered persona to enter the league belongs to Zlatan Ibrahimovic. I still remember the first Ajax training session I ever worked, way back in 2004. It was also the first time I met the striker, then a lanky 22-year-old. He battled like an overly snotty foe in training, and could not stay away from a ball after it ended. He cracked numerous jokes to himself, perfectly proud of each one, as he almost absentmindedly pulled off tricks few others would think of trying. Walking away from the practice ground that day, I thought to myself, "Gosh, that is one odd bird." In addition to being one of the most consistently, creatively lethal forwards of a generation (403 goals and 159 assists in 683 total club matches... with feeling), Ibrahimovic is the self-appointed emperor of Cuckoopants Cloudland, and totally fine with it. For instance, check out his latest TV commercial - it may be difficult to decipher that this is a Bosnian ad for a gambling website, but hey. Zlatan is Zlatan. That's not even the best Zlatan chuckle of the week. Though he may come to regret it at some later point, San Jose defensive handyman Florian Jungwirth is already trying to poke the bear.And quite cleverly, at that. Good on ya, sir! Lest anyone think that everything is always all about Zlatan and the Galaxy, monstrous props need to go out to new rivals LAFC. For making strong personnel moves in a time crunch this offseason? For winning their first two games in style? For lifting the local soccer scene? Pffft. I just found out they will have the greatest sports venue concession stand of all time when their new stadium opens next month. I've already mentioned the Beer Belly brick-and-mortar (Koreatown location) on NSC at least once. 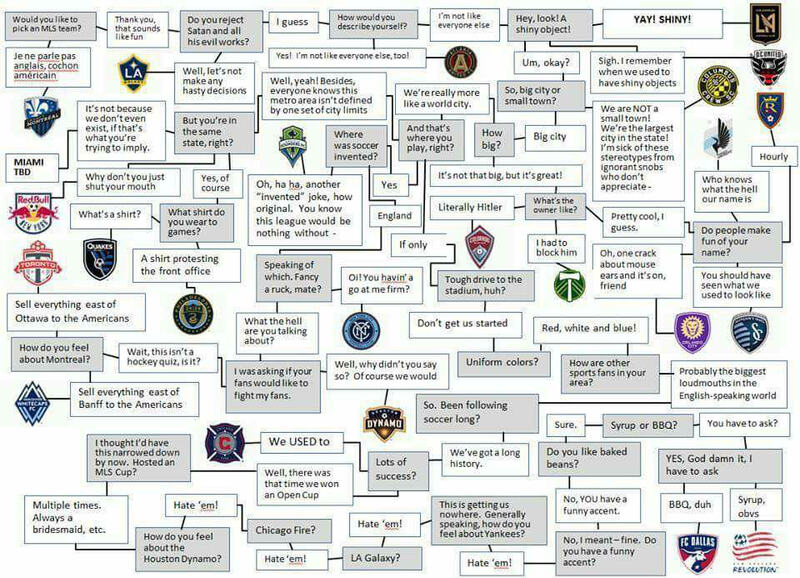 This may be enough to force me to actually choose an MLS side to support. You lucky bastards!!! Finally, we have one of the funniest flowchart memes I've ever seen. It's clever, just biting enough without offending anyone and really rather accurate. Best I can tell this blessed creation is the original work of a Real Salt Lake fan named Ricky. As much as I hate Twitter, his feed is quite amusing.